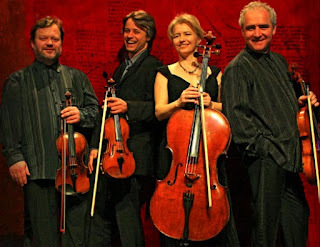 The Brodsky Quartet have been around since 1972, with some personnel changes. Their work with Elvis Costello and Björk earned them a reputation for crossing over boundaries. For tonight’s Kings Place concert (Friday 9 September), though, we were treated to a wonderfully intense hour of core classical repertoire, including a Shostakovich quartet (No. 4) from the complete set they have just recorded live in Amsterdam for Chandos, Mendelssohn's Fugue in E flat, Op. 81 and Beethoven Große Fuge (Great Fugue). The Brodskys stood up to play, slightly offset to stage left, presumably in the knowledge that the acoustic 'centre of gravity' in Hall One is not central. There is no showbiz in their delivery, rather a sense that they were there to serve the music. I have had a summer of country-house and open-air opera and the Proms – all wonderful – but the clarity and intimacy of this performance were something very special. Shostakovich wrote his fourth quartet, his Opus 83 in D, in 1949, but he waited until after Stalin’s death in 1953 to give it a first performance, probably to keep those Jewish themes away from Stalin’s ears. As the Brodskys’ viola player Paul Cassidy wrote in his short introduction in the programme, “the work has everything”. It opens with an expansive Central-Asia landscape that turns to the composer’s claustrophobic 1940s angst that we have recently been reminded of in Julian Barnes’ “The Noise of Time”. The exquisite second movement has a nostalgia that evokes Borodin’s world. The Jewish themes turned into something more macabre in the third and fourth movements: as Paul Cassidy said in his programme note: “Given the circumstances in which this was composed one cannot overlook the horrific, nightmarish image of people being forced to dance on their own graves”. Indeed, the animated Brodskys provided a stomping dance of their own, and the relentless picking of the up-bow of the viola gave it a spooky, sinister feel. From the ‘attacca’ fourth movement they were unstoppable, until the brakes were slammed on, the tender mood of the first movement returned and the whole thing disappeared into the distance. A stunning performance. Daniel Rowland, first violin, gave an introduction to the two fugues that followed. Mendelssohn’s short, lyrical fugue from his Opus 84 set was a palate-cleanser. It put us into ‘fugue’ mode and in a way was a proxy for the Cavatina that precedes the Fugue in its original context, before they segue’d to the rGeat Fugue. Rowland told the story of Beethoven waiting in the pub while his Opus 130 quartet was receiving its first performance. The second violinist of the Schuppanzigh Quartet reported back afterwards that the Cavatina movement had the audience in tears, but omitted to tell Beethoven that half the audience had disappeared during the Große Fuge. The anecdote certainly made us speculate on Beethoven’s intention in composing something (and having lost his hearing altogether by now) that was so difficult to play and to listen to at the time, and still is two hundred years later. It seems a way into the piece is to keep listening in and out of context, and prefaced with some pointers such as we had on this occasion. The Quartet used the acoustic to good effect, creating empty space after the monumental chords at the beginning, and took us on a 20-minute roller-coaster ride with amazing contrasts of dynamics and tempo. It was fascinating to watch the communication between the players; it felt risky, yet we also knew we were in safe hands with this scary piece. Stravinsky was quoted in the programme [this is] "an absolutely contemporary piece of music that will be contemporary forever".